The Lewisburg Garden Club’s special projects support education, beautify public spaces, provide learning opportunities and make our community a better place to live and visit. Garden Club members volunteer to maintain the Packwood House Museum’s Oriental woodlands garden. The walled garden, shaded by yews and Japanese cedars, is unique to the area. The Lewisburg Garden Club awards scholarships to graduating Lewisburg High School seniors who have been accepted at accredited institutes of higher learning and who intend to pursue degrees related to such Club interests as horticulture, botany, biology, landscaping, forest sciences and environmental sciences. Scholarship Committee members review student applications in May and make presentations at Lewisburg High School’s Senior Recognition and Awards Ceremony in early June. 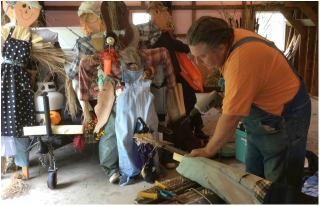 Each September a colorful band of scarecrows appear in Lewisburg’s Hufnagle Park. The scarecrows are designed, dressed and installed by Lewisburg Garden Club members who have been creating the ever-changing cast of scarecrow characters since 2006.
and designing unique floral arrangements. The Lewisburg Garden Club holds its annual plant sale in late April during Lewisburg’s premier event—the Lewisburg Arts Festival. The Club’s Arts Festival booth is a garden shop offering a variety of garden accessories and tools along with annuals, perennials and herbs. Club members provide many of the plants from their own gardens.